Sadly due to a fragile design iPhone 4 problems are all too common causing various issues for our Perth & Western Australian customers. With any repair to a broken iPhone 4 you should accept no less than our Perth price beat guarantee. In addition, your service should also be quick, easy, and pain less; something the Ninja delivers effortlessly with on the spot repairs in most cases. So when you’re in the market for an iPhone 4 fix why go anywhere else? The qualified Ninja-technicians are waiting with Zen like patience for your iPhone 4. So why not drop down to our shop or call us now. Specials: iPhone 4 On The Spot Repairs! Dropping an electronic gadget is common and unless you possess the reflexes of a ninja chances are you cracked your glass screen. Eighty percent of all iPhone 4 issues we encounter are related to smashing the digitizer. The iPhone 4 LCD is fused to the touch screen meaning they are one unit but thankfully we can now replace the glass screen separately. This means whether you have a cracked screen, unresponsive touch screen, patterns on the screen, or dead pixels then Phone Ninja will be your repairer of choice. Are you experiencing short battery life on your mobile? Do you have iPhone 4 charging problems like not holding charge, or even turning on? Does your phone turn off as soon as you remove it from the charger? A iPhone 4 battery replacement will fix most issues above, but of course with all repairs bring your mobile down to our stores for a complete diagnosis. If you have taken your mobile for a dip lately, then you are in luck as we are experts in troubleshooting. If moisture has gotten in your cell it is best to turn it off and gently towel it down. From here bring the device down to our shop & we’ll dissemble, remove any moisture, and then work out what damage has been done. Sometimes the stylish nature of new phones has its drawbacks, and the iPhone 4’s fragile rear glass is a great example. Much like the front iPhone 4 glass, if dropped from the wrong angle the rear glass will smash. While this glass piece is only cosmetic, it will be hard to use with glass shards in your hand. Thankfully this iPhone 4 repair part is one of the easiest & cheapest parts to replace. Other iPhone 4 Faults we repair include the Home button becoming unresponsive, iTunes error codes, recovery loops, password recovery, button repair, and much, much more. Problems like those mentioned above can be difficult to fix, but whatever your issue come down to our shop for a chat. Why risk your mobile with fly-by night backyard technicians or DIY online “how to fix a iPhone” guides? Get your mobile fixed right the first time. 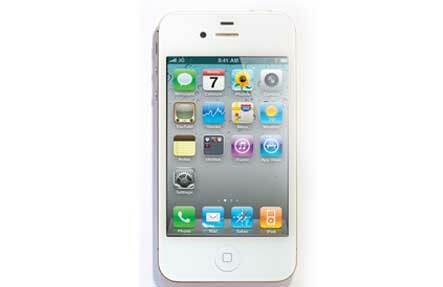 The iPhone 4 launched on June 24, 2010 with arguably more changes and advancements than any of its predecessors. The reviews were full of praise, many singling out the mobile’s high-resolution retina display and its’ tried and tested IOS interface. The retina display is named so because the 960×640 resolution is more than the human eye can see. The iPhone 4 also packed with a 800mhz processor, 512MBs of RAM, as well as a new front camera for video calls otherwise known as Facetime. Further enhancements were also made to the main camera upping the megapixels to 5 and the video resolution to 720p HD. The iPhone 4 cell is available in 16 GB and 32GB models to date.